There are terms you will come across over and over when working with fractals, noises and the like. behavior without much reading up in a user manual. Frequency is a well established term and refers to the number of occurrences of a repeating event per unit. In Computer Graphics, when generating a Noise it will start repeating itself at one point. The Frequency determines the size/scale of the Noise features or in other words think of it like the "Texture Repeat" of the Noise. Two different frequencies on the same noise. 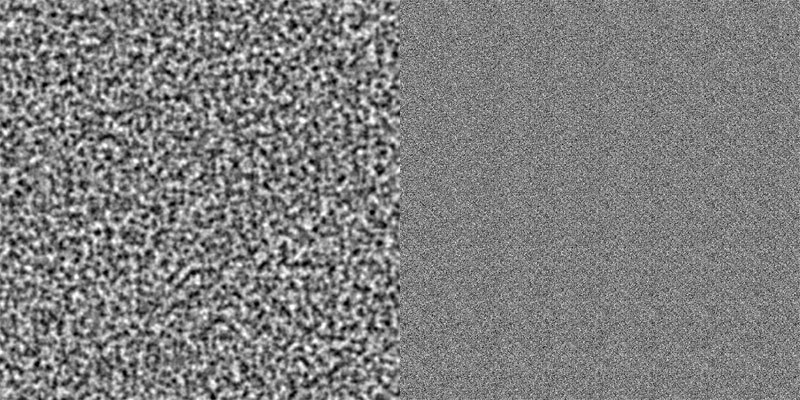 Notice the repeating noise pattern on the right. 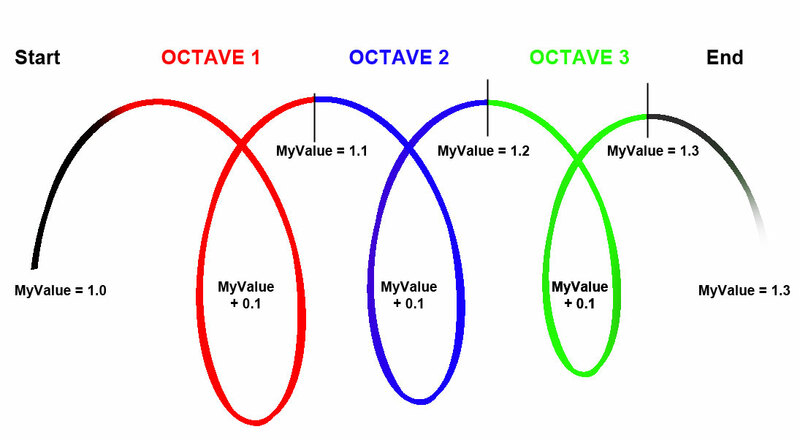 Octaves is probably the most important term to understand when working with any procedural. It describes the number of loops that the code is run - making for finer and finer detail. Most operations within a fractal or noise are run encapsulated within these loops. Let's look at a simple example. In the below case we have 3 Octaves. of 0.1 added. The trick here is that MyValue will get larger and larger with each loop: For each loop add 0.1 to MyValue. In simple terms think of it like two noises with different sizes being overlayed making for finer and finer detail. Changing the lacunarity on a simple noise. Notice how it looks like a second changing fractal overlayed over the first. In the official wording Amplitude describes the maximum disturbance from the undisturbed position of a wave. Gain usually refers to a constant value being added to another one for each loop of an octave. Amplitude meaning that the Amplitude changes between octaves. Seed refers to a value that is used as a starting point to calculate the noise. Changing the Seed usually changes the look of the noise without changing the look or size of its features. Noise B gets used to modulate Values of Noise A. (the default noise way) but also change dramatically each loop of an octave. A multiFractal refers to a procedural that is generated out of different fractals. You could wire one noise into attributes (such as the octaves, lacunarity etc.) of another noise. This adds complexity and reduces repetition on any procedural since instead of a constant value driving the specific attribute it is changing across your model / between pixels.